Monday, December 7, 1835.Vandalia, IL. Lincoln is present at opening of special session of Ninth General Assembly. Forty-eight of 55 members answer House roll call. In afternoon, Democratic convention, first Illinois state-wide political convention, meets in House.House Journal. Wednesday, December 7, 1836.Vandalia, IL. Select committee appointed to draft House rules reports and recommends two new standing committees, "Roads & Canals, Agriculture," and "Commerce and Manufactures." Report recommending nine members on each standing committee is adopted.House Journal. Thursday, December 7, 1837.Springfield, IL. Lincoln writes William A. Minshall of Rushville that Stuart will run for Congress again. Let "our friends in your parts know. . . . Write me all you know and all you think, in regard to our prospects. . . . We have adopted it as part of our policy here, to never speak of Douglass at all. Is'nt that the best mode of treating so small a matter? "Abraham Lincoln to William A. Minshall, 7 December 1837, CW, 1:107. Friday, December 7, 1838.Vandalia, IL. Senate sits with House to hear address of Gov. Carlin. He advocates comprehensive system of common schools, expresses opposition to state banks, and favors Illinois & Michigan Canal. No roll calls are taken but it is safe assumption that Lincoln is present.House Journal. Saturday, December 7, 1839.Springfield, IL. Lincoln gets judgment by default in chancery case of Wood et al. v. Ross. Judgment is for amount of note, $827.56, with interest at 6 per cent from December 15, 1838.Record. He writes answer of Thomas Morgan in State Bank of Illinois v. Quinton et al. As guardian, he files answer to petition of Lucy C. Haines v. heirs of Isaac Haines & Haines.Photocopy. Monday, December 7, 1840.Springfield, IL. House assembles in new state house to begin regular session of Twelfth General Assembly. Lincoln opposes placing unfinished business of last session in same order in present session. He introduces bill to provide for payment of interest on state debt, and on his motion, bill of Peck of Cook for that purpose is read second time by title.House Journal. Tuesday, December 7, 1841.Springfield, IL. N. H. Purple, attorney for defendant in Walker and Hack v. McCoy, assumpsit, files plea in U.S. Circuit Court. Logan & Lincoln are attorneys for plaintiff.Record. Wednesday, December 7, 1842.Springfield, IL. Logan & Lincoln file in the U.S. District Court a petition, inventory, and list of creditors of George Legier of Wabash County. On their motion, Judge Pope sets February 1, 1843, for the preliminary hearing of the bankruptcy case In re Legier.Record. Thursday, December 7, 1843.Springfield, IL. Moore v. Nelson & Ashworth, ejectment case begun in U.S. Circuit Court December 12, 1842, is continued. Logan & Lincoln appear for plaintiff, and Baker and Bledsoe for defendants.Record. Lincoln's account is charged 88¢ for seven yards of calico, bought by hired girl.Irwin Ledger. Saturday, December 7, 1844.Springfield, IL. Logan & Lincoln enter motion to withdraw replication filed yesterday in Napier v. Wooldridge in U.S. Circuit Court.Record. Monday, December 7, 1846.Springfield, IL. Lincoln writes assignment of errors in Wilcoxon v. Roby (SC) and signs Logan's name.Herndon-Weik Collection, Library of Congress, Washington, DC. Tuesday, December 7, 1847.Washington, DC. Lincoln votes for Thomas J. Campbell for clerk. He is elected. House and Senate listen to President Polk's message in which he accuses Mexico of "invading the territory of the State of Texas, striking the first blow, and shedding the blood of our citizens on our own soil." Congressional Globe. Lincoln also signs petition for appointment of John Raub to minor post. Endorsement: Chester Butler et al. to Robert E. Horner, 7 December 1847, CW, 1:417. Thursday, December 7, 1848.Washington, DC. Lincoln arrives at capital and takes seat in House.Globe; National Intelligencer, 8 December 1848. Friday, December 7, 1849.Springfield, IL. Lincoln writes a letter of recommendation to U. S. Secretary of State John M. Clayton on behalf of Dr. Edward A. Guilbert of Ottawa, Illinois. Guilbert seeks an "appointment in connection with a foreign mission." Although he is not personally acquainted with Guilbert, Lincoln is "well acquainted " with two other references for Guilbert—Illinois Supreme Court Justice John D. Caton and Circuit Court Judge Theophilus Lyle Dickey. Lincoln describes Caton as a man "of the Democratic faith...and every way a worthy gentleman." Of Dickey, Lincoln writes that he "is a good and true Whig...and a most reliable man." Based on Caton's and Dickey's recommendations, Lincoln is "entirely willing to endorse their statements. I doubt not, Dr. Guilbert is worthy of all they say in his behalf." Abraham Lincoln to John M. Clayton, 7 December 1849; John D. Caton to Abraham Lincoln, 29 November 1849; Theophilus Lyle Dickey to Abraham Lincoln, 30 November 1849, all in General Records of the Department of State, 1789-1949, Appointment Records, Applications and Recommendations for Office, Applications and Recommendations for Public Office, 1797-1901, Record Group 59, National Archives and Records Administration, College Park, MD. Saturday, December 7, 1850.Springfield, IL. On Lincoln & Herndon's motion Costen v. Costen et al. is continued. Record. Lincoln writes additions to chancery bill in case. Herndon-Weik Collection, Library of Congress, Washington, DC. Tuesday, December 7, 1852.Ottawa, IL. Lincoln and Johnston continue to hear claims. Wednesday, December 7, 1853.Springfield, IL. Defendant in Amos v. Ransom, mechanics lien, is ordered to pay Lincoln & Herndon's client $23. In Spear v. Hay, ejectment suit, jury finds their client, John Hay, defendant, not guilty. Lincoln writes instructions to jury. Agreed verdict with leave to appeal to Supreme Court is entered in Coffin et al. v. Springfield, Illinois. Lincoln & Herndon represent complainant. They have four other cases which do not come to trial. Record; Herndon-Weik Collection, Library of Congress, Washington, DC. Friday, December 7, 1855.Springfield, IL. By agreement of attorneys, Moore v. Alsop & Hickox is set for hearing Monday. Pea v. Williams goes to jury, which brings verdict for plaintiff and assesses his damages at $211. Lincoln & Herndon represent plaintiff. Record. Mary L. Welles gives Lincoln power of attorney for heirs of Charles Welles in Mahoney v. Welles et al.Photocopy. Monday, December 7, 1857.Springfield, IL. In U.S. Circuit Court, Lincoln files praecipe for nine cases brought by S. C. Davis & Co., wholesale merchants of St. Louis. All are brought to enforce payment of notes given for merchandise. Files. Tuesday, December 7, 1858.Springfield, IL. John T. Stuart, one of the plaintiffs' attorneys in the U. S. Circuit Court case of Cochran & Hall v. Camp et al., writes and signs a notice informing the defendants that he will obtain the depositions of some witnesses in the case. Lincoln & Herndon are two of the attorneys representing the various defendants in a dispute over the title to some U. S. Government land warrants. 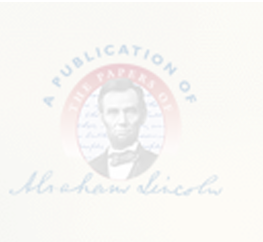 Lincoln endorses the notice and writes, "It is hereby agreed that the testimony of the above witnesses may be taken upon oral interrogatories by the parties or their agents without filing any written interrogatories." He signs the document "Lincoln & Herndon for Defts." Notice, Agreement, 7 December 1858, Cochran & Hall v. Camp et al., Record Group 21, case file 5; Bill for Conveyance, filed 25 August 1855, Cochran & Hall v. Camp et al., Record Group 21, case file 5, both in U.S. Circuit Court, Southern District of Illinois, National Archives and Records Administration, Great Lakes Region, Chicago, IL. Leavenworth, Kansas Territory and En route. Wednesday, December 7, 1859.Leavenworth, Kansas Territory and En route. Lincoln writes sentiment in autograph album of Mary Delahay, daughter of Mark W. Delahay, his host. He begins return trip. N.Y. Tribune, 30 August 1860; Inscription in the Autograph Album of Mary Delahay, 7 December 1859, CW, 3:504. Friday, December 7, 1860.Springfield, IL. Lincoln writes passage from "House Divided" speech for E. B. Pease of Springfield, and adds certificate of genuineness. Certified Transcript of Passage from the House Divided Speech, 7 December 1860, CW, 4:147. Saturday, December 7, 1861.Washington, DC. President recognizes Pedro Pablo Ortiz as vice consul of Republic of Chile for port of New York. National Republican (Washington, DC), 10 December 1861, 2:6; National Intelligencer, 10 December 1861. Lt. Barstow of Gen. Dix's staff delivers to Lincoln Japanese sword reported stolen in Baltimore. N.Y. Times, 8 December 1861. Mrs. Lincoln holds morning reception. N.Y. Times, 8 December 1861. Sunday, December 7, 1862.Washington, DC. 5 P.M. Sunday dinner party at White House includes Sen. Browning (Ill.), Sen. Harris (N.Y.), and members of President's staff. Nicolay to Bates, 7 December 1862, John G. Nicolay Papers, Library of Congress, Washington, DC; Browning, Diary. Monday, December 7, 1863.Washington, DC. 10:20 A.M. President telegraphs Mrs. Lincoln in New York: "All doing well. Tad confidently expects you to-night. When will you come?" Mrs. Lincoln replies: "Will leave here positively at 8 a.m. Tuesday morning. Have carriage waiting at depot in Washington at 6 p.m. Did Tad receive his book. Please answer." 7 P.M. President telegraphs reply: "Tad has received his book. The carriage shall be ready at 6 P.M. tomorrow." Abraham Lincoln to Mary Lincoln, 7 December 1863, CW, 7:35; Abraham Lincoln to Mary Lincoln, 7 December 1863, CW, 7:35. Issues press release on Union success in Tennessee and recommends that all loyal people assemble informally in churches and render homage to God. Washington Chronicle, 8 December 1863; Announcement of Union Success in Tennessee, 7 December 1863, CW, 7:35. Refers to military situation at Knoxville and comments: "Now if this Army of the Potomac was any good . . . if the Army had any legs, they could move 30,000 men down to Lynchburg and catch Longstreet. Can anybody doubt, if Grant were here in command that he would catch him?" Memorandum, 7 December 1863, John G. Nicolay Papers, Library of Congress, Washington, DC. Wednesday, December 7, 1864.Washington, DC. President confers with Cong. Francisco Perea (New Mexico Terr. ), delegate to Republican National Convention, regarding appointments. Memorandum Concerning New Mexico Appointments, 7 December 1864, CW, 8:157. Transmits to Senate documents relative to aid furnished by British subjects to rebellion. Abraham Lincoln to the Senate, 7 December 1864, CW, 8:157-58. Interviews Sen. Hicks (Md.) again regarding Maryland commission to investigate character, decide loyalty, and issue certificates. Abraham Lincoln to Edwin M. Stanton, 7 December 1864, CW, 8:158. Consults with Abel R. Corbin, party worker, about vote in House of Representatives on constitutional amendment. Corbin to Lincoln, 8 December 1864, Abraham Lincoln Papers, Library of Congress, Washington, DC. In afternoon receives annual formal visit in Blue Room by six justices of the United States Supreme Court. Daily National Republican (Washington, DC), 7 December 1864, 3d ed., 2:6. Chief Justice nominee Salmon P. Chase makes social call on President. Randall, Lincoln, 4:273.